Go full crush with this powerful arsenal for escaping the overwhelm and living to your potential. 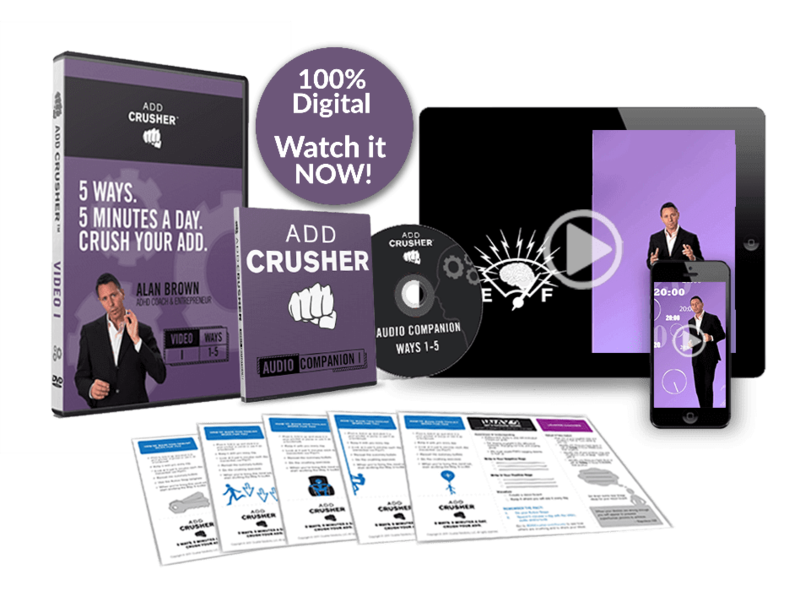 Two powerful Videos and their Audio Companions provide four hours of ADD-beating instruction from your “virtual coach”, Alan Brown. Plus, PDF Toolkits for each of the strategies (or, Ways), provide “crib notes” to help you put the learning into action. You can do a LOT of adult ADD-crushing just by understanding the impact of diet, exercise and sleep. There\’s a lot of BS out there about herbal remedies, miracle foods, etc. There ain’t no miracles. But there ARE things you can eat, do and avoid to reap immediate and substantial results. Way 1 provides an ADD diet checklist to set a powerful foundation. In Way 7, we slay the barriers that result in procrastination. But even when we get busy with a task, we are notorious for getting sidetracked — and so we never seem to finish anything. Way 8 gives ADD adults the trick to staying on task so there\’ll be a lot less undone stuff left to haunt you. We adults suffering from ADHD symptoms are notorious for focusing on our failures and overlooking our successes. It\’s detrimental to our progress toward our goals in life. And it’s also ridiculously illogical. Way 9 gives you the perspective AND the tools needed to score more successes. "These videos are extremely effective and ADD-friendly. 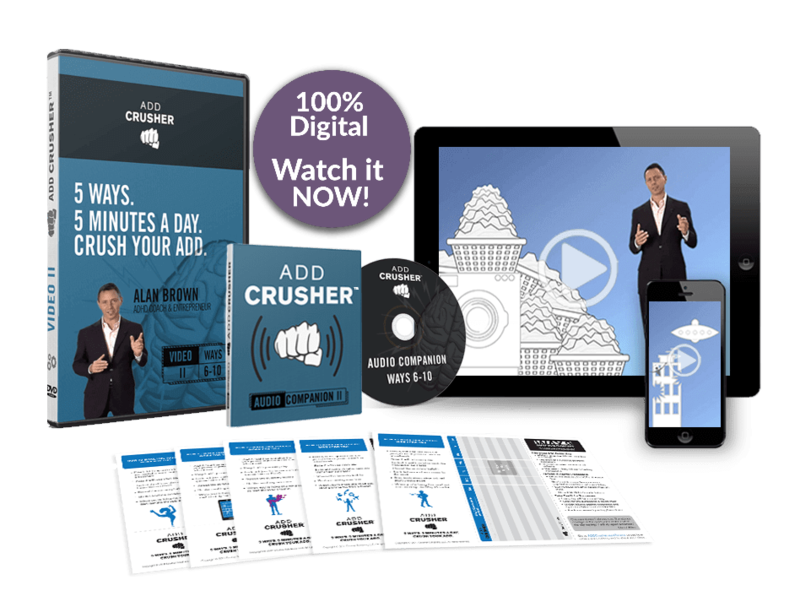 If you can tie your shoe, you can change your life with the Crusher approach." One of the most unique, amazing and innovative resources I’ve seen for helping people minimize their challenges with ADHD. 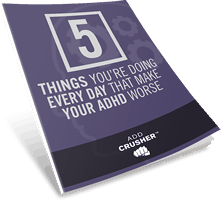 A must-have for anyone with ADHD or who works with people with ADHD.